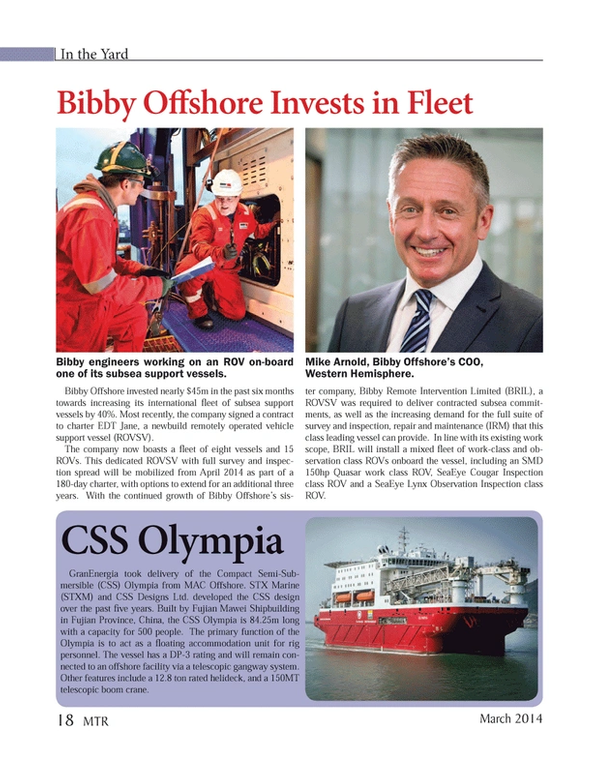 Bibby Offshore invested nearly $45m in the past six months towards increasing its international fleet of subsea support vessels by 40%. Most recently, the company signed a contract to charter EDT Jane, a newbuild remotely operated vehicle support vessel (ROVSV). The company now boasts a fleet of eight vessels and 15 ROVs. This dedicated ROVSV with full survey and inspection spread will be mobilized from April 2014 as part of a 180-day charter, with options to extend for an additional three years. With the continued growth of Bibby Offshore’s sister company, Bibby Remote Intervention Limited (BRIL), a ROVSV was required to deliver contracted subsea commitments, as well as the increasing demand for the full suite of survey and inspection, repair and maintenance (IRM) that this class leading vessel can provide. In line with its existing work scope, BRIL will install a mixed fleet of work-class and observation class ROVs onboard the vessel, including an SMD 150hp Quasar work class ROV, SeaEye Cougar Inspection class ROV and a SeaEye Lynx Observation Inspection class ROV.